POMMARD, FRANCE – Rootstock, Burgundy’s music, wine, and food festival returns this summer for the French holiday Bastille weekend (July 13-­‐15, 2018). The festival will feature a roster of chart-­‐topping international acts, including British band Jungle, Canadian group Soul Jazz Orchestra, Swiss band Le Roi Angus, and Nigerian-­‐born guitarist Keziah Jones. This international lineup will be completed with the French pop electro group Isaac Delusion and a special Bastille Day DJ set of the unmissable Breakbot. Château de Pommard throws open its doors and invites international travelers to its new luxury Pop Up Hotel, where guests can sleep in an elegant outdoor setting surrounded by hundreds-­‐year-­‐old vines and 17th-­‐century architecture. Discover the finesse of food and wine pairings in the Chefs Alley, learn to taste like a professional in the Burgundy tasting seminar, bike the ancient vineyards on a guided cycling tour, meet the chicest designers from Paris and Marrakech or join your friends and family for a picnic in the ancient Clos Marey-­‐Monge. With 50,000 US travelers heading to Burgundy from May to September, the Californian owners of Château de Pommard, want to share their love of the French countryside and music with fellow Burgundy-­‐lovers around the world. The team at Château de Pommard conceived of the Rootstock music festival to attract world-­‐class talent to the region, and to support young, rising artists at the beginning of their careers. Awarded annually to select performers, the Rootstock Artist Package, provides financial support early in an artist’s career including; professional recording studio time at Paris-­‐based Studio Ferber, media promotion and, connection with booking agents. Theo Maxyme, a 2017 Rootstock Artist Package winner, recently released his first single ‘Sur le Fil’. The song is topping the rock chart on iTunes France. Founded in 1726 by Vivant Micault, secretary to King Louis XV, Château de Pommard remains one of the most iconic and visited wine estates in Burgundy. Clos Marey-­‐Monge, at the heart of the domain, has been producing one of the greatest expressions of Pinot Noir for more than two millennia. The 20-­‐hectare clay and limestone rich terroir make it the largest and most interesting monopole in the Côte d’Or. 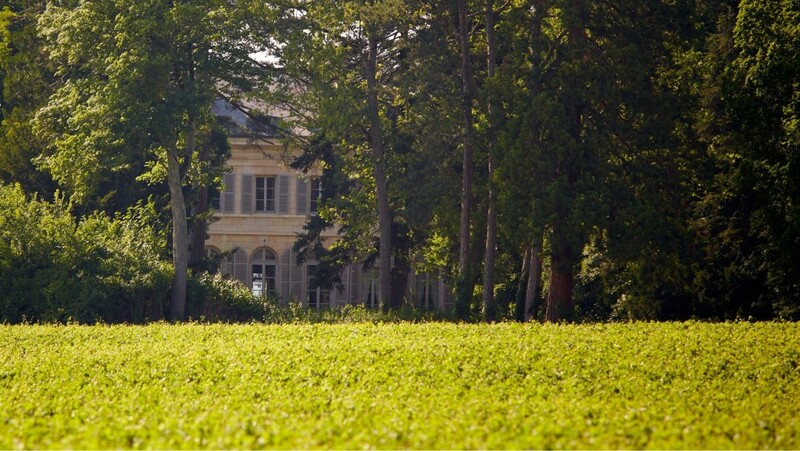 In July 2015, UNESCO declared the clos a world heritage protected Climat of Burgundy. The Carabello-­‐Baum family of San Francisco purchased the domain in 2014 and became just the fifth family to guide the estate in almost 300 years. The family has transformed the estate into the ultimate wine education destination where anyone can experience the phenomenon that is Burgundy. Vintage Eve Circa 1/2015: What’s Happening in Our Local Bonded Winery? If you live anywhere in the Santa Clarita Valley, and you are into wine, you probably already know that we have a wine tasting room in downtown Newhall. You might even know that we have a licensed and bonded winery in the Valencia industrial center. But did you know that our only winery has become a home for many commercial and non-commercial wineries…many of which use our local winemakers as consultants? Maybe even up to 15 wineries? Yes, this is the growth that local winemakers Steve Lemley and Nate Hasper have seen since opening their TWO doors. You can taste Paso Robles wine at Pulchella Winery Thursday through Saturday evenings, and make an appointment to see the SCV Winery facility if you would like to make your own wine. EB: Steve, please tell us a little (because I know you do a lot) about what you do at the winemaking facility. SL: Nate and I fuel our passion and produce all of Pulchella Winery’s allocations here along with working with 15 other wineries as their consulting winemaker to produce their wine labels as well. Producing wines in small lots from fruit sourced primarily from the central coast. We are super excited to have invested in state of the art equipment, expanded the operation and opened it up to a select group of other wineries and vineyard owners who share our stylistic approach to winemaking. EB: And do we get to taste the fruits of your effort in your Newhall tasting room? Tell us about your current releases and if club memberships are available. SL: Absolutely! Pulchella Winery’s current releases are poured in our tasting room Thursday through Saturday from 5pm to 10pm without any appointment needed. We are currently pouring 8 wines. In spring, we will release the next allocation, which we are by far the proudest of as we have had time to focus the brand and make some really solid wines. Our wine club has recently re-opened to new members, which offers just two allocations a year, 20% off all purchases, free tastings and more. For a full list of current and upcoming wine releases, visit our website. 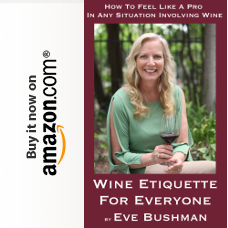 EB: How about a story of something funny that has happened during your years of winemaking…something wannabe winemakers might be interested in. SL: We get asked a lot how the Westside Paso Robles, Cerro Prieto vineyard Pinot Noir named “Deadbeat”, fell into our program. In spring 2013 we took on a project with a new client and were asked to source some of the best quality Pinot Noir from the Paso Robles Willow Creek area. Making an extensive amount of Pinot Noir for clients in the past, we took the challenge and poured our hearts, souls and wallets into the project just to have the client inform us a few months later that he could not continue and would not be able to pay for any of the fruit and barrels. Given that we sourced and paid for the fruit, produced the wine and designed the barrel program for it, it only seemed right to release it under Pulchella Winery’s label and see what everyone thought. The now past client got the wine named after him and it was loved by everyone so much that it has now become a staple in our portfolio of wines. EB: Can you give us an update on the vines you and Nate helped plant at College of the Canyons? SL: For the last two years Nate and I have also expanded our operation to include full scale vineyard management for many of our clients. Donating our time as full time vineyard consultants for College Of The Canyons is a dream come true for us. The college shares a vision with us and the fruits of everyone’s labor is starting to take shape. After the 50 year old zinfandel transplant project was completed, we have planted another zinfandel block and have completed the architectural design and installation of yet another Syrah block. We have had a 100% success rate with the vineyard and are very proud to have been given the freedom to establish an infrastructure that will offer a very complex curriculum of viticulture and enology in the future for COC students. We will continue to manage the project until COC has a program in place to take it over. EB: What do you and Nate see for the future? SL: It’s easy to increase production but we want to honor the support we have and will not increase our production so that we can offer the same quality wines year after year to everyone who supports us. We will continue to focus our brand and dedicate every waking moment to increasing the quality of our wines and the wines we produce for our clients. Santa Clarita will soon have other very high quality brands to enjoy and we are humbled to be involved with the vision and production of them. Visit our website or come visit us in the tasting room and see what’s down our dirt road of passion. The winery tasting room is located at: 24261 Main Street in the Old town Newhall historical district. (91321). 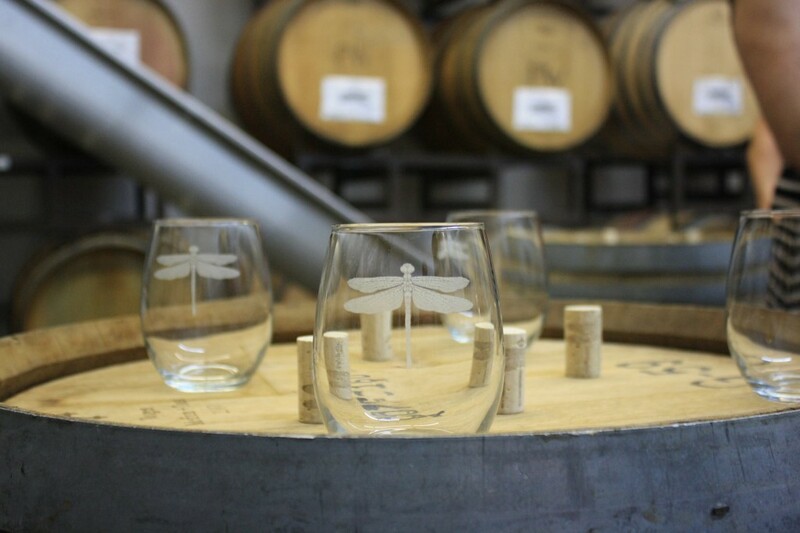 For current tasting room hours, please call our tasting room at 661-799-wine. Closed most major holidays. Dealing with 9am traffic to Downtown LA is not my idea of fun. However the powers that be selected a venue, Redbird Restaurant, which had a very nice private room for a medium-sized group of sommeliers and other very interested people in the wine trade. Why? Check out the wine list below, now completed with my tasting notes, as well as some of the interesting things I learned about Grenache from Patrick Comiskey, Wine and Spirits Magazine and author of American Rhone, and Peter Fraser, winemaker for Yangarra Estates. The vines for this wine date back to 1946, 14.5% alcohol, 100% Grenache and approx. $25 bottle. Fraser showed us photos of the grapes before and after sorting: very uniform in color and no stems. He said this wine shows a richer riper wine. All hit their “sweet spot” after 10 years of aging. Comiskey added that all Grenache are “gloriously aromatic” in the glass. Dusty red cherries, raspberry jam and bark; bright red fruit, dry, long length. 100% Grenache, this was my first favorite of the tasting, and as our second to taste I was reminded of what Fraser said, the winemaking “should transcribe a sense of place.” This CDP definitely didn’t have the same aroma or flavor profile of the first Yangarra. Darker red fruit, cigar, smoke, male sweat; rose petals and other florals showed in the mouth. Bright red fruit, raspberry, green forest floor, earth; berry, stems, medium finish. Fraser said this one was “more restrained”, 100% Grenache, 14.5% alcohol and about $90 a bottle. Fraser also said they do most of their Grenache as single varietals that allows for silky, tannic and perfumed structure. Sweet black cherry, milk chocolate, and a hint of a wet forest and barnyard; red to blue fruits, dark, dusty and tannic. Alcohol at 15% and a price tag of about $155 a bottle. Sweeter nose, floral, Port notes, bursting red fruit and dark cherry; noted the higher alcohol on the mouth, red fruit, tannic. A year older than the first High Sands we tasted. With 14.8% alcohol, 100% Grenache and a $90 price tag. Fruit felt darker, could definitely note that wee bit of longer age on this one; tart red fruit and tannic. My second favorite in the tasting so far. Although both Comiskey and Fraser seemed not to care for this wine it proved to be my favorite of the tasting. 100% Grenache, 16% alcohol and about $155 a bottle. Much darker fruit, smoke, oak and forest floor; well-balanced fruit, pepper and a nice long finish. And here was our cult wine and one I really looked forward to tasting as our finish. With 15.7% alcohol, from the Sta. Rita Hills AVA, $330 a bottle and the only GSM blend in the tasting: 78% Grenache, 19% Syrah and 3% Mourvedre. Comiskey had read a bit from his book on American Rhônes and I recalled that he wrote that Grenache is the “organizer” of every blend and has “unique varietal gifts.” The varietal may have been born as Garnacha in Spain “but is now grown wherever there is abundant sunshine.” Also a favorite but I still enjoyed the Torbreck best. Perfumy, aromatic, great red to darker fruits, slightly sweet; huge red fruit in the mouth, spice and an incredible length. 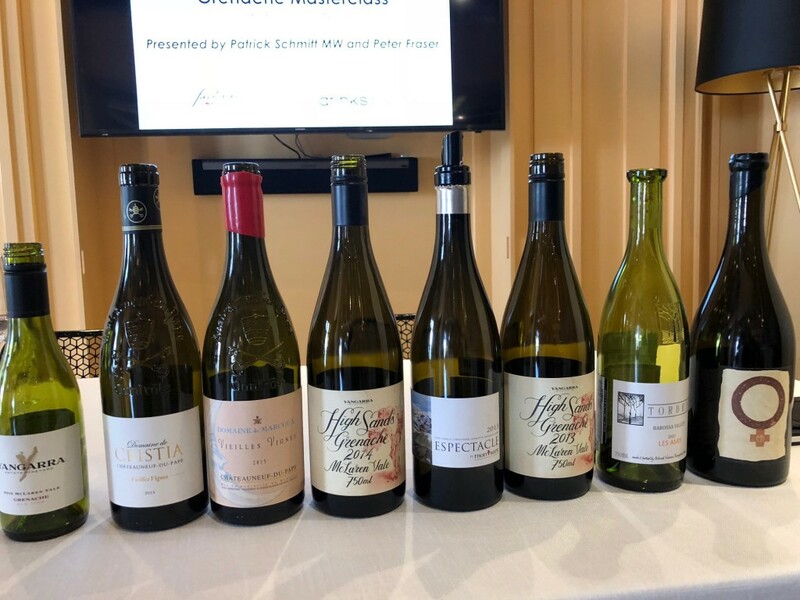 The…educational masterclasses…are designed to draw attention to the quality of wine possible from this underrated grape, particular when sourced from very old vines in Australia’s McLaren Vale. Among the wines on show (were) biodynamic wines from Châteauneuf-du-Pape’s Domaine de Cristia and Domaine de Marcoux as well as Female from Sine Qua Non, which is made with 78% Grenache by Manfred Krankl, a champion of Rhône grapes in the state. However, leading the line-up will be Grenache from Yangarra Estate in the McLaren Vale, including the producer’s flagship High Sands Grenache, which is created using biodynamically-farmed fruit from bush vines planted in 1946. …Named Australian Winemaker of the Year for 2016 by eminent wine critic James Halliday, Fraser is a highly respected figure in the Australian wine industry, and one whose expertise centers on Rhône grapes, in particular Grenache, having made wine from the variety since 2000 at Yangarra Estate. Fraser…agreed to compare his wines to the greatest varietal Grenaches from around the world, which included not only the rarest expressions from the aforementioned Domaine de Cristia and Domaine de Marcoux, but also Spain’s Espectacle, a pure Grenache from 120 year-old vines in Montsant, made by René Barbier, famous for Priorat’s Clos Mogador. The award-winning McLaren Vale winemaker has also said he will show his wines alongside Australia’s celebrated varietal Grenache from the Barossa Valley: Torbreck’s Les Amis, which is made using grapes from vines planted in 1901. This tasting will provide an educational look at Grenache using a selection of extremely rare wines made from one of the trade’s most underrated grapes. (WALLA WALLA, Wash.) — On the heels of another busy summer season and grape harvest, Walla Walla is already looking ahead to 2018. A slew of recent and planned lodging, dining, and winery openings are poised to further elevate the unofficial capital of Washington wine country. Eritage Resort: Long a dream of Justin Wylie, the founder and winemaker for Va Piano Vineyards, Eritage is nearing reality. Poised to open in early 2018, Eritage is nestled on 300 acres surrounded by vineyards, and will include 10 luxury suites and a restaurant directed by Jason Wilson, a well-known Seattle-based chef and James Beard Award winner. Bledsoe Family Winery: Owned by Walla Walla native and former NFL star Drew Bledsoe and his family, Bledsoe Family Winery was recently founded as a sister project to their existing Doubleback label. Bledsoe Family Winery was created to push boundaries and to add new wine varietals to its portfolio, and their gorgeous downtown tasting room is a new can’t-miss stop. The Saint & The Sinner: The newest project of Jake and Tabitha Crenshaw, the owners of local favorite Olive Marketplace & Café, are set to bring a whole new concept to downtown Walla Walla. The Saint & The Sinner officially opened Nov. 18 as a hip, modern Latin American cantina unlike anything that precedes it in Walla Walla. Barons Winery: Founded in Woodinville, Wash., Barons opened a state-of-the-art winery and barrel aging facility earlier this year in the heart of Walla Walla. Barons wines are crafted to be ready to drink upon release, or to sit in the cellar to age. La Quinta Inn & Suites: Greeting travelers entering the western gateway of Walla Walla, just off off U.S. Highway 12, La Quinta has opened a brand-new, 77-room hotel. The new La Quinta features a lounge and wine bar, as well as an indoor pool, and offers an affordable option for those who want to experience all that Walla Walla has to offer. Armstrong Family Winery: Armstrong Family Winery’s Tim and Jen Armstrong have decided to put down permanent roots in Walla Walla. Founded in 2011 in Woodinville, Wash., Armstrong Family Winery will embark on a new era with a downtown Walla Walla tasting room, a 22-acre farm that features a vineyard with two blocks of 17-year-old Cabernet Sauvignon vines, and a new production facility. Walla Walla Indian Cuisine: Local brothers-in-law Gurjeet Sandhu and Gurpreet Gill bring traditional Indian cuisine to downtown Walla Walla. The new restaurant offers authentic Indian food from a kitchen led by a Mumbai-trained chef who moved from New Orleans to Walla Walla, adding a new flavor to Walla Walla’s culinary landscape. For more information on planning a trip to Walla Walla, go to visitwallawalla.com. As the unofficial capital of Washington wine country, Walla Walla is home to more than 120 wineries, a nationally recognized culinary scene, access to an abundance of outdoor recreation, and an arts & entertainment scene that rivals cities many times its size. This community of just over 30,000 residents is known for many things, including its friendliness and hospitality, the quality of its wine, and of course the famous Walla Walla Sweet Onion. An easy and scenic four-hour drive from Seattle, Portland, or Boise, Walla Walla can also be accessed via Alaska Airlines daily non-stop flights from Seattle. 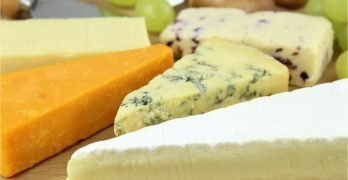 For more information and to begin planning a trip to Walla Walla, go to www.visitwallawalla.com. The Paso Robles winery and its vintage-trailer vineyard-camping experience is honored with a Best of the West award in the August issue. August 2017 (Paso Robles, Calif.) – Alta Colina Vineyard & Winery is pleased to announce it has won a 2017 Sunset Magazine “Best in the West” Travel Award – and is the only winery to be honored this year. The award – which highlights the wine and its new vintage-trailer campground located on a secluded hilltop in the winery’s estate vineyard – is featured, along with a photo, in the August 2017 issue, on newsstands now. The Sunset Travel Awards honors the top game-changing and stylish destinations and experiences across the 13 Western states, British Columbia, Alberta and Western Mexico. In addition to being the sole winery honored, Alta Colina Vineyard was the only Central Coast destination in this year’s awards. 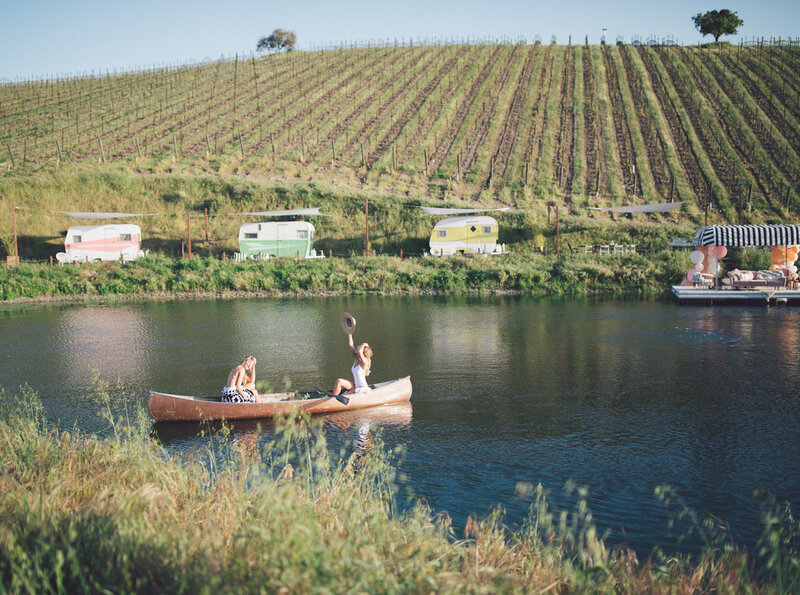 The Trailer Pond is situated around a secluded pond nestled in the center of Alta Colina’s organic estate vineyard, and boasts five refurbished vintage trailers by Templeton-based Tinker Tin Trailer Co. Guests wake up to stunning, unobstructed views of Paso Robles’ famous Adelaida District, enjoy coffee among the vines, and savor lazy wine-tasting days strolling through the vine rows. The vineyard-camping experience – the only one of its kind in California – includes a complimentary tasting of Alta Colina’s Rhône-inspired estate wines, and offers additional tours and experiences, including the Summit Vineyard Tasting , Cellar Door Tasting, and more. For more information about Alta Colina, and to book your stay at California’s only vintage trailer vineyard campsite, please visit altacolinawine.com. Alta Colina produces world-class Rhône varieties from its vibrant estate vineyard in the Adelaida District of west Paso Robles. With a dedication to organic farming practices, Alta Colina crafts critically acclaimed wines that reflect and honor the land. For more information, please visit, altacolinawine.com, or visit the tasting room at 2825 Adelaida Road in Paso Robles. ABOUT TINKER TIN TRAILER CO.
Tinker Tin Trailer Company specializes in vintage trailer rentals ranging from the 1920s-1960s used for events, production, camp outs, and more. Their rental collection consists of Vintage Trailer Bars, Vintage Vending Trailers, Vintage Trailer Photo Booths, Vintage campers for overnight stays, as well as Tipis and Tents. Based out of the Central Coast, with USA wide travel- Tinker Tin’s historic vintage trailers are a great addition to any event. www.tinkertin.com. 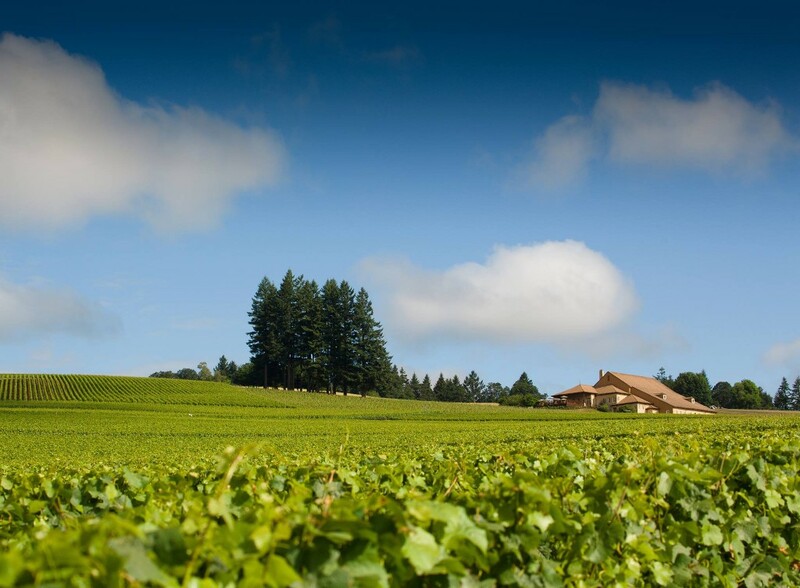 NEW YORK, NY (PRWEB) – This month, Domaine Drouhin Oregon, the family-owned and operated Joseph Drouhin estate based on U.S. soil, kicked off its celebration of 30 years of success in the Willamette Valley’s Dundee Hills. Now run by the family’s fourth-generation, each of the four siblings play a large role in the success of the historic brand. The eldest, Philippe Drouhin, tends to the viticulture and sustainability of the vines, Véronique Drouhin-Boss, the winemaker and guiding palate of the estate, continues to surprise and delight with exceptional Pinot Noir and Chardonnay wines, Laurent Drouhin leads the marketing initiative in the U.S. as the face of the brand, and Frédéric Drouhin oversees all operations as President. Together, they complete a perfect unity utilizing centuries-old Burgundian winemaking traditions in Oregon. Joseph Drouhin founded the Burgundy estate in 1880. His son Maurice Drouhin succeeded him in 1917, and his son – and current patriarch of the family – Robert Drouhin, became the third generation to run the business in 1957. It was Robert who first “discovered” Oregon on a visit in 1961. He recognized that it was Oregon (more so than California) that had the soil, latitude, and climate that could unlock the complexities and potential of Pinot and Chardonnay in the US. In 1987, Robert purchased property, and the newly christened Domaine Drouhin Oregon produced its first vintage in 1988 from purchased grapes. The following year they built the landmark, four-story gravity flow winery, producing the first ever vintage on the property in 1989. “There is a big difference between ‘family-owned’ and ‘family-owned and operated.’ We live in Beaune, we live in Oregon, and we are in the vineyard and at the winery tasting every day. It is our family name on the label so we must be in control of every detail to ensure the wine can bear our name,” added Frédéric Drouhin. During a series of kick off events, the family opened their estate and cellars with guided vineyard hikes, special tastings of vintages from DDO, Roserock – the latest of the Drouhin family’s adventure located in Oregon’s Eola-Amity Hills – and Maison Joseph Drouhin. Each night ended with various themed dinners, such as a La Paulée-style “Le BBQ” which featured a blue grass band and multiple large-format free pours. The series also included an extraordinarily special tasting of some of the estate’s very first vintages including a 1989 Domaine Drouhin Oregon Pinot Noir Classique (the very first vintage produced at the estate, of which there are only 24 bottles left). Guests also tasted through various vintages – including the first ever vintage – of Chardonnay Arthur (2015, 2012, 2002), Pinot Noir Laurène (2000, 1996, 1992), and Pinot Noir Louise (2007, 2003, 1999) – the three cuvées named for each of Véronique’s three children. Both her son Arthur and daughter Laurène took part in the celebration, adding another dynamic to the intimate affair – commenting wistfully on the wines, how they’ve aged well with time, and how the family has, as well. “When I taste the first vintages of the Arthur, Laurène, and Louise, I am profoundly reminded of the day each of them came into this world,” added Véronique. It was an incredibly moving evening for guests and the family alike. Events were attended by friends of the family, members of the wine club, the media, importers, distributors, and neighboring estates such as: Eyrie Vineyards, Adelsheim, Ponzi, Casteel and Sokol Blosser families. Forever grateful for the continued community support, the four siblings and their children also performed the “ban bourguignon,” a tradition specific to Burgundy sung in celebratory honor, in this case directed in honor of their father, grandfather, great grandfather, and their esteemed guests. Philippe Drouhin also led a number of informative vineyard tours throughout the DDO and their new Roserock estates. “After 30 years of observation of our vineyards in Oregon, every year I realize that the level of knowledge of the viticulture in Burgundy is sometimes useful in Oregon. We will spend the next 30 years really getting to know the vines – this estate is young and we are still learning,” he explained. Robert Drouhin’s vision of an Oregon estate winery that could rival the great vineyards of Burgundy has been realized at DDO. From what began as test plantings of cloned Pinot Noir rootstock now encompasses 52ha (130 acres) planted in the Dundee Hills and 50ha (124 acres) planted in the Eola-Amity Hills. Interspersed with the Pinot Noir vines are 11 acres of Chardonnay, planted at various elevations and, like in Burgundy, planted right alongside rows of Pinot Noir. The densely planted vines are farmed sustainably on L.I.V.E. certified vineyards, and tended to by hand when leaves and fruit are thinned. Harvesting is also done entirely by hand, from the grape selection and picking to press. For more information about the estate, visit: http://www.domainedrouhin.com. Maison Joseph Drouhin owns 77.7 hectares (192 acres) of vineyards in Burgundy. The vineyards are principally Grand and Premier Cru appellations of the Côte d’Or and Chablis. The family-owned and –run firm was founded in 1880 and produces nearly 90 different appellations, all of them from Burgundy. 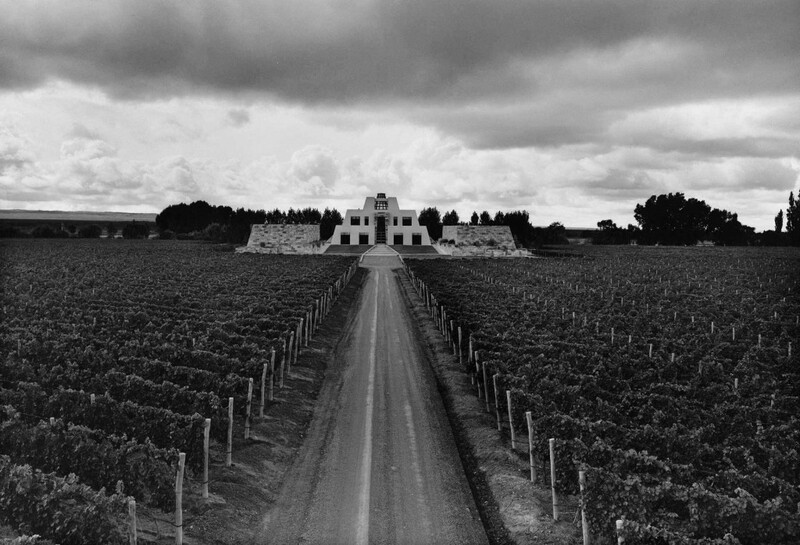 Since 1987, the family also owns 219 acres in Dundee Hills, known as Domaine Drouhin Oregon, and 229 acres in Eola-Amity Hills, known as Roserock since December 2013. New York, NY – Attention, wine lovers: the Wines of Brazil have made their way to the U.S. and are ready to take the country by storm. Internationally celebrated for its soccer players and its Rio Carnival, Brazil is also home to a variety of flavorful wines that will delight American consumers in search of young and fresh wines, at great value for money. In a region known for its at times excessively powerful wines, Brazil stands out for its production of lighter, friendly and easy-drinking wines. Brazilian wines offer a surprising and high-quality alternative to your usual wines choices, being generally pressed from the varietals you love: Chardonnay, Pinot Noir, Merlot, both still or sparkling. Embodying the soul of the country, Brazilian wines are lively, aromatic and colorful, and will be the life of the party! Shake up your habits and pop a Brazilian sparkling wine for your next festivities. Characterized by an exceptional acidity and freshness, they are ultimate crowd-pleasures. Many of the producers follow the méthode traditionnelle – the same as Champagne – Brazilian sparkling wines are mainly produced from Chardonnay, Italic Riesling, Pinot Noir and Muscat. Aromatic and vivacious, they can be enjoyed on their own as an aperitif, or with all kinds of every day food such as sushi and light salads. Brazilian reds will delight every red wine lover: from fruity to earthier reds, the region is home to a palette of vibrant reds pressed mostly from Merlot and Cabernet Sauvignon, which produce elegant and structured wines. With lower alcohol contents than similar New World wines (around 11-12.5%), they can be sipped during the day, without fears of headiness. The wines’ aromatic flavors combined with mild tannins make them a perfect addition to the dinner table: fresh and young, they will not overwhelm your meal’s flavors. Sip them with a BBQ-grilled meat to feel like a proper Brazilian enjoying a churrasco, the country’s iconic ember-grilled steak. Serra Gaúcha – the leading region in terms of production, representing 85% of all wines produced in Brazil, it is recognized for its fruity reds and fine sparkling wines. The basaltic soil, humid climate and mild nights produce wines with a distinctive personality. Campos de Cima da Serra – known for its aromatic whites, and elegant and sophisticated reds, the region enjoys moderate temperatures and consistent winds, which guarantee healthy vines. Serra do Sudeste – celebrated for its low-yield vines and delicate wines with great minerality, this mountainous region is recognized as one of the most promising wine areas in Brazil. 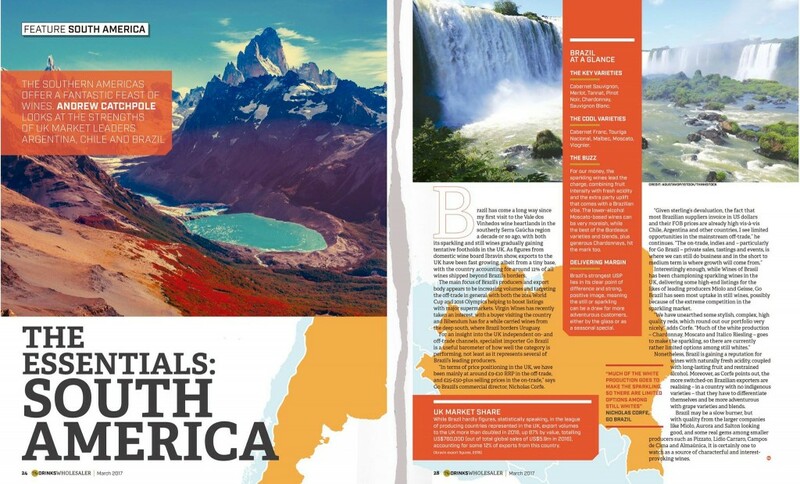 Campanha – located in the south, bordering Uruguay and Argentina, the region is devoted to vinifera grapes, including Cabernet Sauvignon and Syrah, but also Tannat and Tempranillo, and is recognized for its flavorful reds. Planalto Catarinense – known for its high-altitude vineyards, Planalto Catarinense is celebrated for its fresh still and sparkling whites. The region is also developing an interesting organic and biodynamic wine production. Vale Do São Francisco – the most northern vineyard in Brazil, its grapes have higher sugar levels, creating bold and fruity wines. The region is also known for its full-bodied reds, high-quality Moscato sparkling wines and exceptional yields with two harvests a year. Wines of Brasil, is an organization that represents 34 wineries that produce wines in six appellations: Serra Gaúcha, Campos de Cima da Serra, Serra do Sudeste, Campanha, Planalto Catarinense, Vale Do São Francisco. The main mission of the Wines of Brasil project is to promote the quality of Brazilian wines in the international market. To achieve this goal, its work starts within the wineries, providing producers with guidance on how to export, which results in promotional campaigns in different parts of the world, including the participation in wine fairs and direct contact with trade agents and opinion makers. The Brazilian wineries produced for the export market over 2.2 million liters and commercialized to 36 countries from January to December 2016. The exports to the USA market have increased 34.64 % in 2016. Yountville, Calif. – New for 2017, Yountville Chamber of Commerce has retained the creatives behind the wildly successful Yountville Live (and Live in the Vineyard) to produce its highly anticipated annual wine and food festival – Taste of Yountville. This annual walkabout tasting festival features renowned food and wines that make Yountville a world-class destination for all things refined and gastronomic in pleasure. Taste of Yountville, March 17-18, has now commingled with the Yountville Live weekend happening March 16-19. The coalescence of these events will provide attendees with several ticket options to experience a music, food and wine sensory experience over four jam-packed days. A beautiful, Yountville welcome in the Brix Restaurant gardens, featuring French inspired California cuisine, 10 Yountville appellation wineries, and an intimate performance by multi-Platinum and GRAMMY Award nominated singer-songwriter Five For Fighting. A four-course wine dinner prepared by world renowned chefs and winemakers featuring Graham Elliot and Thomas Keller Group’s – Team USA. Thursday Night Concert, 9-10 p.m.
An exclusive, up-close-and-personal performance by internationally acclaimed Mexican acoustic rock guitar duo Rodrigo y Gabriela. Late Night VIP Events, 10 p.m. to 1 a.m.
Late night bites, artisan cocktails, beers and wines located at Ottimo! In the heart of Yountville. Friday Taste of Yountville, 1 p.m. to 5 p.m.
Ticketholders will enjoy customized programs and activations from event partners at the V Market Pavilion, some of Yountville and Napa Valley’s most revered wineries at the Taste of Yountville Pavilion, an exclusive beer garden and live chef demonstrations at the Culinary Pavilion, and live musical performances at the North Yountville Pavilion (NOYO), making this the must see center of attention during Yountville Live. A grand crew tasting room featuring cult and highest end wine. Master Classes, 10 a.m. – 4 p.m. Exclusive epicurean experiences hosted by world-renowned chefs, winemakers and artisans, offering insight into the creative genesis that makes them the masters of their craft. Music, Food & Wine Dinner, 8-11 p.m.
Intimate food & wine dinners featuring local chefs, winemakers, and private performances by up-and-coming artists. Late Night VIP Events, 11 p.m. – 1 a.m.
Saturday Taste of Yountville, 12 p.m. to 5 p.m.
Ticketholders will enjoy customized programs and activations from event partners at the V Market Pavilion, some of Napa Valley’s most revered wineries at the Wine Pavilion, an exclusive beer garden and live chef demonstrations at the Culinary Pavilion, and live musical performances at the North Yountville Pavilion, making this the must see center of attention during Yountville Live. Exclusive epicurean experiences hosted by local chefs, winemakers, and artisans offering insight into the creative genesis that makes them the masters of their craft. Music, Food & Wine Dinners, 8-11 p.m.
Intimate food & wine dinners featuring renowned chefs, winemakers, and private performances by up-and-coming artists. Bubble Brunch, 11 a.m. to 2 p.m.
Wind down the weekend with a southern inspired, open-fire brunch featuring chef Morgan Robinson from SMOKE, a sparkling wine and mimosa bar and an intimate performance by American folk, soul, pop music duo JOHNNYSWIM. Tickets for all Yountville Live Events can be purchased at https://yountvillelive.com/tickets. Single day or weekend long admission tickets are available for the Taste of Yountville attraction at Yountville Live. Tickets range from $125 per person for a single day admission or $225 per person for both Friday and Saturday. Tickets include one tasting with each vendor and unlimited access to all four event tasting pavilions: V Market Pavilion – food, wine and more, Wine Pavilion – wine tastings, Culinary Pavilion – cooking demos, tastings and a beer garden, and the North Yountville Pavilion – live music, food and wine. The third annual Yountville Live, the ultimate, luxury getaway event, featuring exquisite cuisines from world-class restaurants and Award-winning rock star chefs, exclusive intimate performances from some of today’s hottest recording artists and a unique variety of some of Napa Valley’s most celebrated wineries and finest beers and spirits available, is set to take place in Yountville, California from March 16th to the 19th. Tickets are on sale now for the four day event in the culinary capital of Napa Valley that will feature performances by multi-Platinum selling Five for Fighting, internationally acclaimed Mexican acoustic rock guitar duo Rodrigo y Gabriela, duo JOHNNYSWIM, well-known singer-songwriter Emerson Hart, up and coming trumpet sensation Spencer Ludwig, a DJ set by the talented Mayer Hawthorne, rising sibling trios JOSEPH and The Rua, singer-songwriters LOLO, Jillette Johnson, Brendan James, Jon McLaughlin, Zach Heckendorf, Paul Loren, Keaton Simons and more. World renowned and celebrated chefs set to take part in Yountville Live are Graham Elliot, Gale Gand, Victor Scargle, Thomas Keller Group – Team USA, Michael Chiarello, Art Cohtino, Bob Hurley, Carey Delbridge, Nate Lindsay, Chris Cosentino, Chris Kollar, Chris Patrick, Claudia Sansone, David Roberts, Dean James Max, Ernesto Martinez and more. There will be pourings by some of the most revered vintners including Aaron Pott, Benoit Touquette, and Julien Fayard and high end wineries including Jessup Cellars, Trinchero, Robert Mondavi Winery, Franciscan Estate Winery, Campana Ranch Winery, Azur, Miner Family Winery, Nickel & Nickel Winery, Silver Trident Winery, Priest Ranch Winery and more. Yountville marries a breath-taking setting and small-town ambiance with a sophisticated Wine Country lifestyle. Yountville Live is the next generation of food and wine events with a vast array of events for attendees to choose between from Master Classes that are a true epicurean experience hosted by world-renowned chefs, winemakers and artisans, offering insight into the creative genesis that makes them the masters of their craft to intimate dinners, performances and of course the “Taste of Yountville” experience. Yountville Live has something for everyone that will not only compliment and highlight all the best that Yountville and the Napa Valley have to offer in the culinary and winemaking world with truly incredible music infused, but also the best across the country has to offer in all three. This four day event is an up close and personal experience while being on a larger scale. For further information about Yountville Live, journalists are asked to contact Denise Carberry, dcarberry(at)pfamedia(dot)net, or visit the event website at yountvillelive.com. Follow the event on Facebook, Twitter and Instagram. Live in the Vineyard is a private music-food-wine festival that marries peoples’ access to recording artists, top tier wine makers, and world- renowned chefs amongst the lush scenery of the legendary Napa Valley. Tickets for LITV, taking place again in November 2017, are only available through special radio station promotions featured on http://www.liveinthevineyard.com that include Sirius/XM The Pulse, On-Air with Ryan Seacrest, On with Mario Lopez, and Premium Choice Hot AC. Tickets are also available through exclusive sweepstakes and offerings from LITV’s partnerships with Aloft Hotels, National Car Rental Enterprise Rent-A-Car, Sutter Home, Southwest Airlines, Stella Artois, UPS, Sacramento International Airport and a few others. Live In The Vineyard assures that attendees have total immersion in music, wine and food. LITV was created by Bobbii Jacobs and Claire Parr, who together share over 40 years of experience in the music industry, and has since grown into a well-known and sought-after ticket. Jacobs and Parr are the producers of Yountville Live. Considered the culinary heart of Napa Valley, Yountville is the ultimate luxury get-away. With its world-class restaurants and accommodations, and many of the Valley’s most celebrated wineries, Yountville marries a breath-taking setting and small-town ambiance with a sophisticated Wine Country lifestyle. The small town of Yountville was the site of Napa Valley’s first planted grapevines. The walkable village amid the vines with gorgeous mountain views offers luxe lodging from cozy to indulgent, the only hot air ballooning launch in Napa Valley, five sites on the National Register of Historic Places, unique shopping, golf, art galleries and performing arts, plus a constellation of Michelin stars and renowned restaurants. An ideal base for wine lovers, Yountville’s microclimate pedigree has its own American Viticultural Area (AVA) and offers unparalleled wineries and producers. For further information about Yountville, visit http://www.yountville.com. I first saw a video of how Shannon Ridge Wines raise sheep to sustainably manage their vineyards, rotating the sheep from vineyard to vineyard to control cover crop growth and naturally fertilize the land. I was intrigued. Visiting the Lake County winery and meeting vintner/rancher Clay Shannon underscored the responsibility he feels to protect and maintain the historical vineyard hills of Shannon Ranch planted to Chardonnay, Cabernet Sauvignon, Sauvignon Blanc, Petite Sirah and Zinfandel. On the main Shannon Ranch, where Eastern European immigrants planted grapes over 100 years ago, Clay was prepping for harvest so the sheep grazed on a recently picked vineyard a few miles away. The sheep love grapes, you see, so they can’t graze near ripe fruit because they’d simply eat the crop. But, bring them in while grapes are ripening and they’ll happily eat grape leaves and thin the canopy for better sun exposure. Clay Shannon has trademarked his approach as the Ovis Cycle, The Ultimate Sustainable Farming System. After harvest, the sheep clean up the fallen grapes and other MOG (material other than grapes) and fertilize away as they roam, all naturally. They leave the vineyards spotless and the sheep are fat and woolly. In winter, vines may be dormant but the sheep are lambing and kept warm and protected by the vigilant sheep dogs. 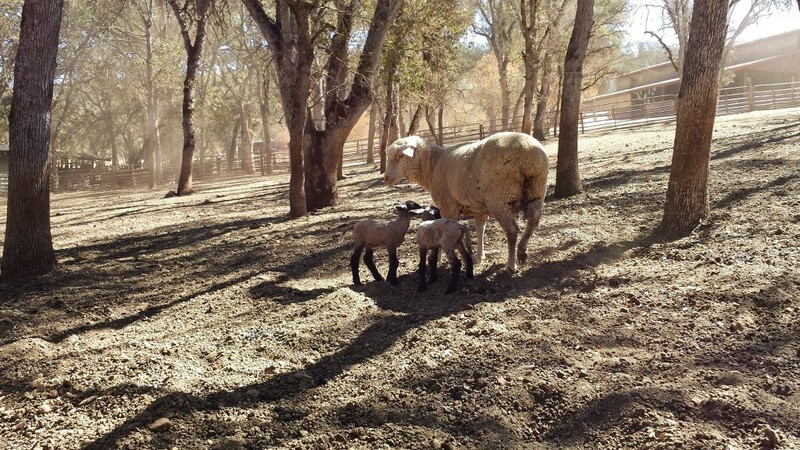 In Spring, the wines are budding, the sheep are sheared and the lambs are weaning. They continue weeding and fertilizing. These sheep graze well, live freely, enjoy life and, eventually are consumed as the cycle of life completes. Shannon Ranch is known for its spectacular naturally-raised lamb, which pairs beautifully with many of the Shannon Ridge wines like the ever popular and well-priced High Elevation Wrangler Red. Grown at 1200-1400 feet it is a staple on many restaurant lists. Also in the High Elevation Brand family is a Chardonnay, Sauvignon Blanc, Zinfandel, Petite Sirah and Cabernet Sauvignon. Restaurants in the know serve the Shannon Ranch lamb right along with the wines for a perfect farm to table experience. As Clay Shannon was discovering the ranch he now calls Shannon Ridge, he found a lot of history both in the winegrowing and in the ranch structures. He unearthed the old winery, complete with old crusher and press, an unknown and still-producing well, a skinning shack and a hand-built stone fence that runs for over a mile. In the process of unveiling all the ranch’s secrets, Shannon’s greatest discovery was a century-old “Mother Vine” that is still strong today. The many offshoots of this old vine Carignane, probably brought from the old country, are the base of the oldest part of the dry-farmed ranch. The old skinning shed is now preserved as the Buck Shack Bar for entertaining customers and trade. “Buck Shack” also happens to be the name of Shannon Ridge’s small batch red blend that reflects the finest fruit from Shannon Ranch. Shannon Ridge farms over 991 planted acres Lake County AVA and the smaller Lake County AVAs of Red Hills, High Valley and Big Valley. 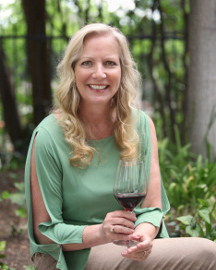 Clay Shannon discovered early the beauty of Lake County wines and their potential quality and affordability and steadily acquired vineyards to become the prominent Lake County winery they are today. Nationally distributed, all estate-grown and sustainably farmed by a true caretaker of the land, Shannon Ridge and its family of wines represent excellent value in the market today.